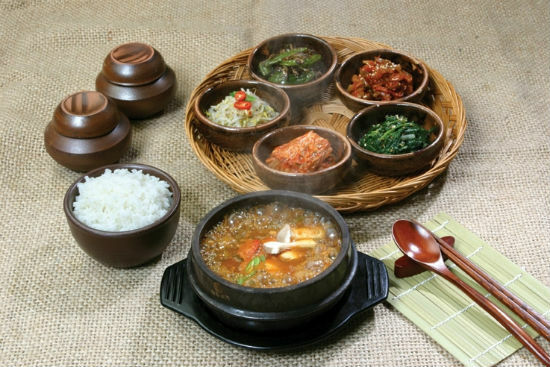 To finish our list of Korean food recommendations, here are the five foods that a non-Korean discovered while travelling in Korea. From a non-Korean perspective, Korean food outside of the usual bibimbap or Korean BBQ can be a mystery. The flavors and ingredients might be far from what we are used to, but if you are up for it, grab your chopsticks and spoon and continue down the flavorful journey! Sundubu Jjigae is a hearty spicy soft tofu stew that can help anyone warm up during the cold (or freezing) winter days in Korea. The soup is traditionally served boiling in the bowl that it was cooked in. A good advice to follow is to let it cool down a little, or else you will end up with a burnt tongue for several days. Mix it with your rice one spoonful at a time! During the hot and humid summer days in Korea, some people live by those words, as they choose to eat “hot” food to beat the heat. The most popular dish to do so is samgyetang, which literally translates to ginseng (sam / 삼), chicken (gye / 계), soup (tang / 탕). It consists of a small chicken filled with garlic glutinous rice, ginseng roots and jujubes. The ingredients of this dish are packed with health benefits that not only make this soup flavorful but also energizing to face the heat. Bunshik, from its literal meaning “food made from flour,” refers to a variety of snacks at a low price that can either be found at snack restaurants or in street food stalls. It includes tteokbokki (떡볶이 / Spicy rice cakes), odeng (오뎅 / fish cakes), gimbap (김밥 / Korean sushi roll), mandu (만두 / dumplings) and many more. Bunshik, in a way, is the Korean version of fast food. Bingsu is part of the (short) list of Korean desserts. 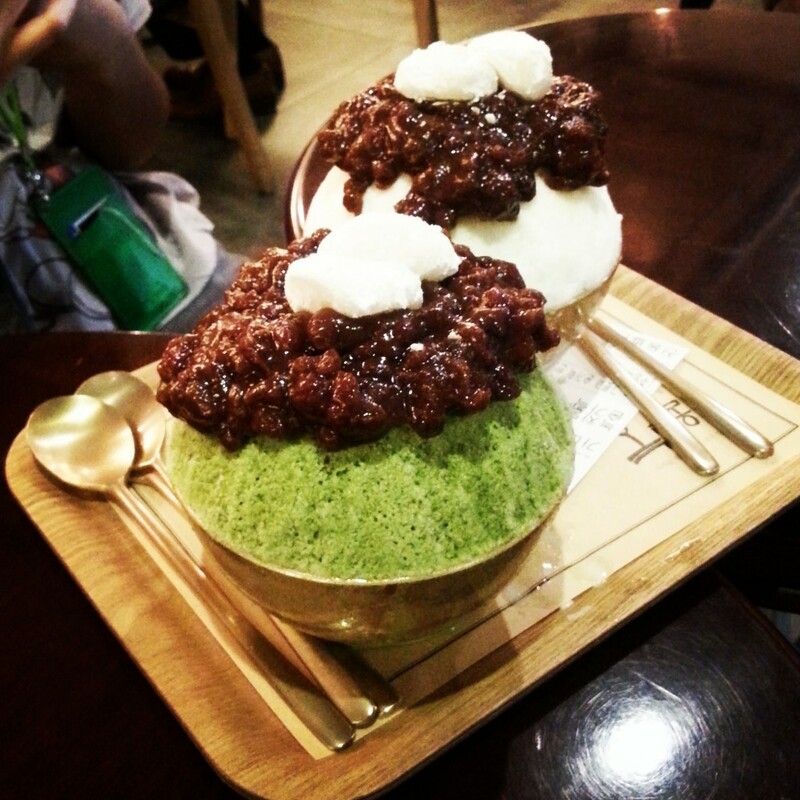 It is a shaved ice dessert traditionally topped with condensed milk, red beans (팥) and rice cakes. It’s usually available during the summer months, but nowadays some popular chains make this item available year-round. 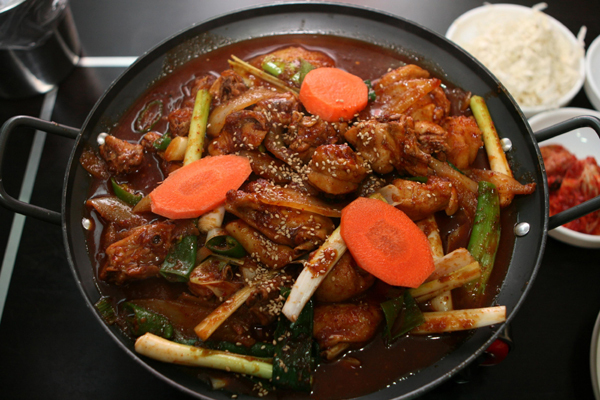 Jjimdak is a dish of braised chicken that originated from the city of Andong. The nutritious dish consists of chicken, vegetables, such as carrots, mushrooms, potatoes and more, simmered in a spicy sauce made with soy sauce, corn syrup, sugar and peppers. Glass noodles and rice cakes are also added to complete this dish. In number 1.Sundubu jjigae (순두부 찌게), 찌개 is correct word not 찌게.